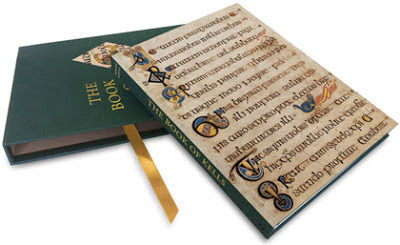 The Book of Kells is widely recognised as one of the world’s most beautiful decorated manuscripts and a masterpiece of European medieval art, with images that are staggering in their richness, intricacy and inventiveness. This handsome new volume, by Dr Bernard Meehan, Keeper of Manuscripts at Trinity College Library, brims with fresh insights and interpretations and features the extraordinary imagery on a generous scale. The publication which was introduced by Professor of History of Art, Roger Stalley also marks the tercentenary of the foundation of the Old Library building, Trinity College Library, Dublin, one of the great historic libraries of the world. The Book of Kells dates from around 800 AD and contains a Latin text of the four Gospels. There is great uncertainty about its origins. It is thought that the Book of Kells was first worked on at the monastery on the island of Iona off the west coast of Scotland, and was continued, after Viking raids, at the monastery of Kells in Ireland. The Book remained in Kells until the mid-1600s, and in 1661 was presented to Trinity College, Dublin, where it is on permanent display, and is regarded as a national treasure. It is seen every year by half a million visitors from all over the world.